It is hard to imagine our crater without its iconic Cross. In the 10 months that it has been missing I still have not got used to it not being there. Very few of the Friends had ever seen the site without it. After all it was always the first thing you saw as you approached the Crater from the village. So when the phone call came from Richard that it had blown over in a storm it was a bit of a panic to begin with. 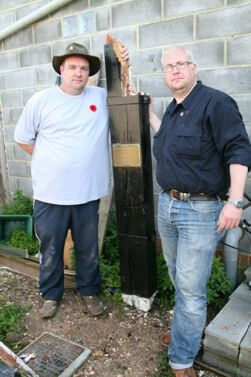 Warren & Iain with the remains of the broken Cross at The Old Blighty Café, La Boisselle. Image courtesy of Clive Gilbert © 2011. As word spread through the Friends, Richard’s phone must have been glued to his ear. Over the next few weeks many ideas came in about what to do and what to replace the Cross with. 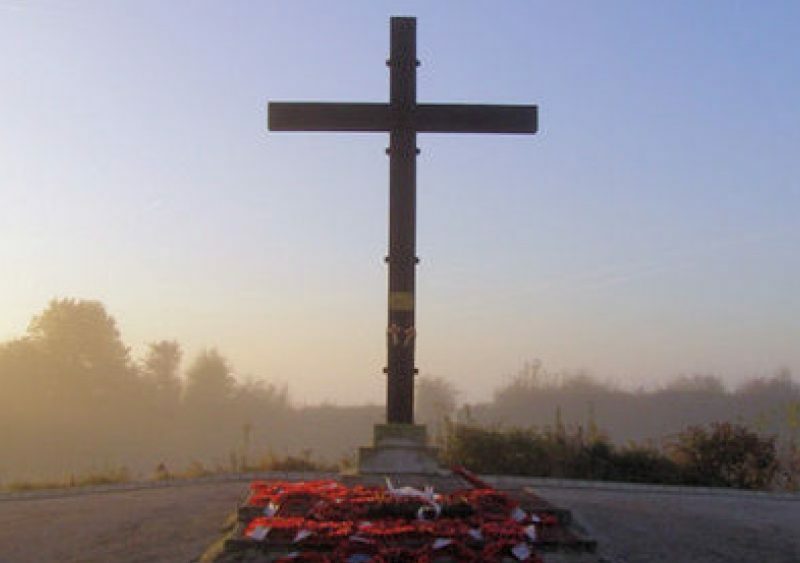 Many ideas, that included a metal or plastic cross, a statue along the lines of the Shot at Dawn or the Longueval Piper. But really there was only one piece to replace the Cross with, and that of course was another wooden Cross. I know many people tried to locate wood and in fact I located some red pitch pine from a 400 year old manor house in Newcastle, similar wood that the original Cross had been made of. But cometh the hour, cometh the man and up to the bar stepped Vinny Felstead, who located some green oak and a wood merchants, Job Earnshaws who were willing to help in every way. But that part of the story is for Vinny to tell. Iain Fry and I travelled to France last September to see for ourselves the damage and what sort of job it would be to replace it. Once again there were many plans put forward, but again it came to Vinny. Driving up to the Crater was very strange as I had never seen the site without its Cross and it was so noticeable that it was missing. The base was a sorry site and Iain and I cleaned it up as much as possible to make it look cared for. 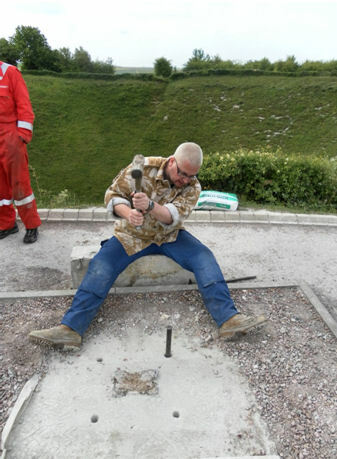 Some of the stones had been displaced and as the remains of the Cross had already been removed out of the Crater itself by Jon Haslock down to Old Blighty Café, we thought it best to also take the stone there as well. And at the time we also thought that a piece of stone had been stolen as there was a piece missing, but as it turned out Martin Pegler had picked it up and taken it back to Orchard Farm to stop it being stolen. 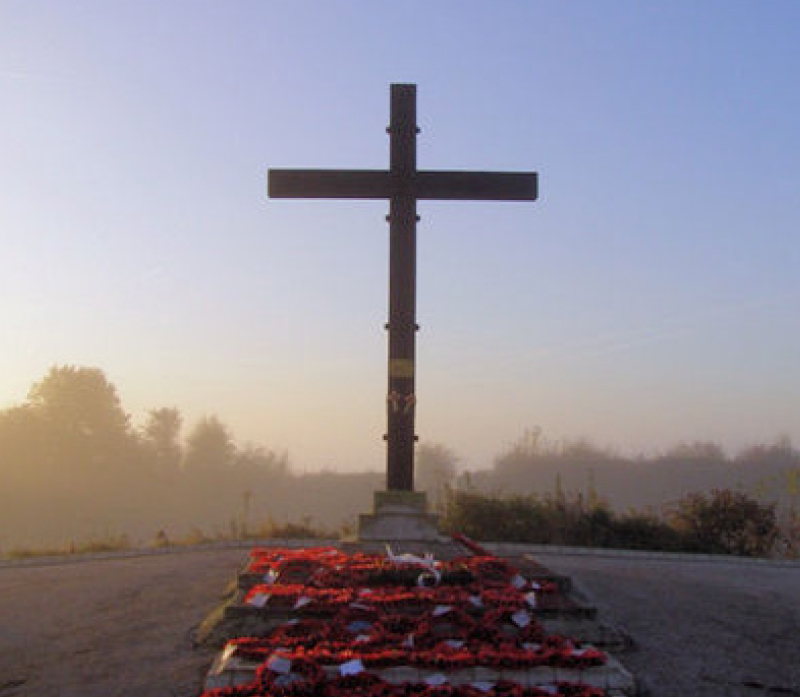 The November ceremony we hold each year was also strange as the Cross is the focal point of the site. The base showing the extent of the rot. Image courtesy of Warren Osborne © 2011. And really the story stops there till this year. As Vinny will be telling the story of the making of the Cross and metal sleeve that it will sit in, my own involvement in this part is very limited. The small amount of work I did in drilling the holes for the securing rods for the base, well that is just a small amount. There were several challenges that day as the concrete base proved too hard and heavy to remove. But once again Vinny proved king with his years of building experience. 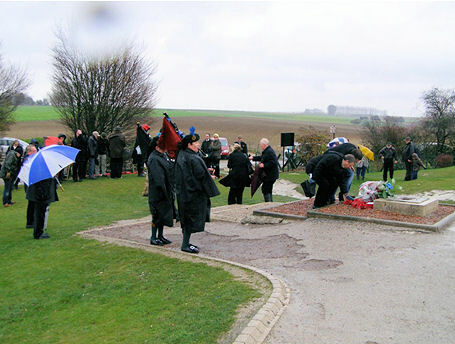 A cold wet November 11th 2010 with wreaths being laid at the tidied up base of the Cross. Image courtesy of Warren Osborne © 2011. 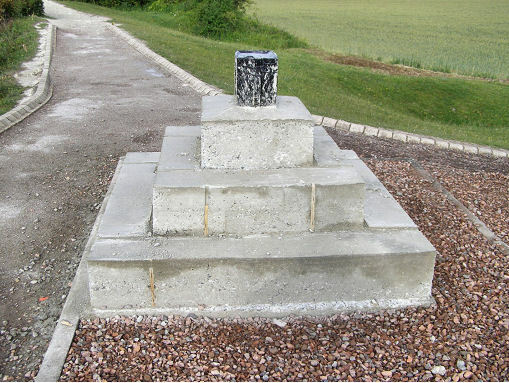 The story must know turn to transporting the finished Cross over to France. Originally we had been quoted by a company a very reasonable price for moving it. But as it turned out they were not very enthusiastic and to date I am still waiting for the paperwork from them to open an account with them so they can move it! But as we were going to use an outside company they asked for the Cross to be placed in a packing crate. Another small problem to overcome, well two really, one was wood to make the crate and the other was making it. Vinny once again was the answer to the last problem. The first I solved. At work we have an engineering company that look after all the machinery in the factory. As it happened they had had some bits of machinery delivered and I went to see Stefan Sockienk, who is the chief engineer. He was only too willing to give us the wood for our good cause. Now it was just a case of getting the wood to Vinny’s. 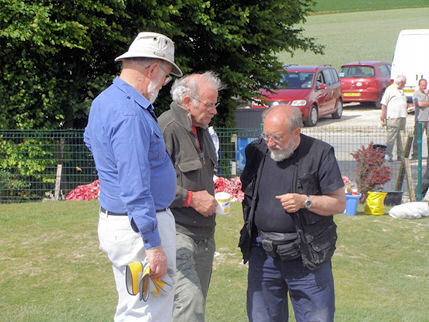 From left to right Roger, Vinny and Richard in deep deliberation. Image courtesy of Warren Osborne © 2011. This was not too hard to sort out as I have one of our lorries pass very close to Vinny and Lynn’s house every day. One of the packing cases was just about the right size for the Cross’s cross piece, the other packing cases had to be dismantled because, as they stood they were no good for what we had in mind for them. So after a few hours work and a lot of splinters they were dismantled and ready for shipping to Vin’s. This I did with one of my company drivers, Michael Smith a few days later. Michael has been with me a couple of times to France and was only too willing to help as well. And once again the hard work had fallen on Vinny’s shoulders. Iain working hard on the base. Image courtesy of Warren Osborne © 2011. 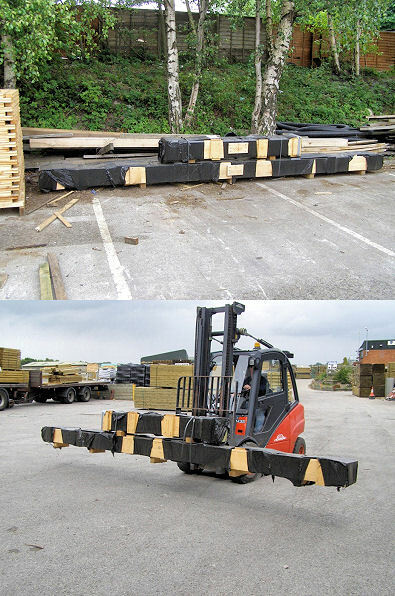 When I finally got to Job Earnshaws to collect the Cross I was very impressed with Vinny’s work on the packing crate, it was a very professional job and kept the Cross safe all the way to France. As our haulage company had dropped out, well more failed us then dropped out I spoke to Richard about this at length and we came up with the plan that I would transport it to France. Another friend of mine at work Royce Sims was only too willing to lend me his car as it had a tow bar fitted and mine didn’t, so now I had a vehicle all I had to find was a trailer and after a couple of phone calls I found one to do the job at my local Indespension Trailer hire company. Here, Damian Ransome, the branch manager was more than helpful, and put up with me nipping in a couple of times to make sure everything was okay. A problem now occurred. 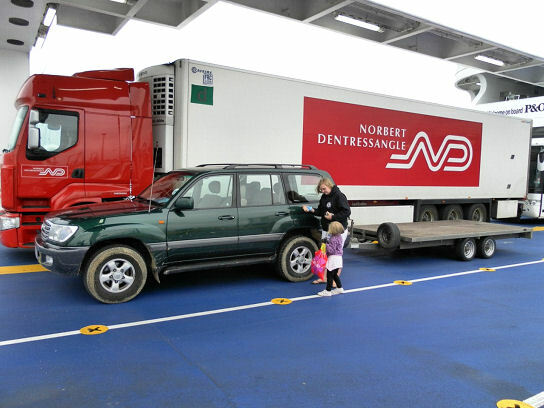 Because of the size of the trailer, Royce’s car was not big enough to pull it as the trailer was rated at 3 tonnes and Royce’s big Volvo was only rated up to 2.5 tons. After a few more phone calls, I found I could hire a Land Rover from a company, but they did not do insurance as they normally rent to companies who would run the Land Rovers on their own insurance. After 30 or more phone calls to insurance companies and having no luck in finding insurance, the words “hire vehicle” and “short term” seem to send most of them into near suicidal melt down. However some other friends of mine was now to come to the rescue. Barry & Christine England who again have both been with me on a Somme visit, own a Land Cruiser Amazon. Barry said it was the least he could do to let me borrow it to take the Cross. He duly insured the Land Cruiser and made sure that the trailer was insured as well. So a big thank you to Barry and Christine for such an unselfish and most generous act. 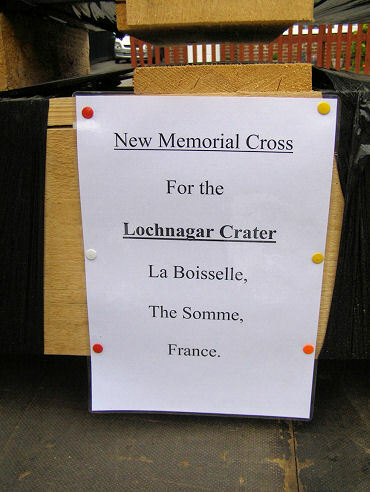 I had set a date for delivering the cross to France for the 11th June. Though I had to collect the cross from Job Earnshaw’s at Midgley near Wakefield on Friday morning. 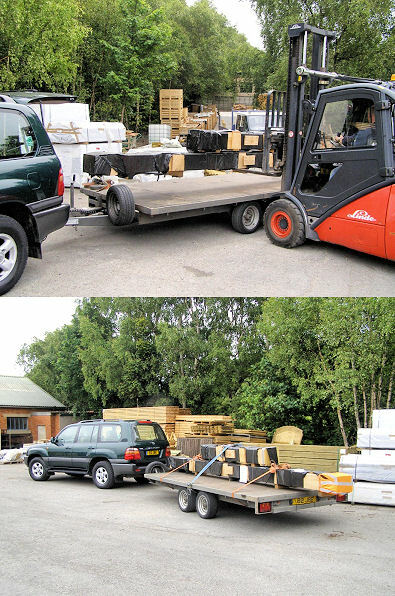 Different stages of loading at the wood yard. Images courtesy of Warren Osborne © 2011. Next it was a 75 mile drive back home, for me this was quite useful as l could see how the trailer towed loaded and how well the Land Cruiser handled towing. Any worries evaporated within a few short miles. So back home it was to load the car and get everything sorted for the journey ahead. And, also to add another precious cargo, two daughters and a son. 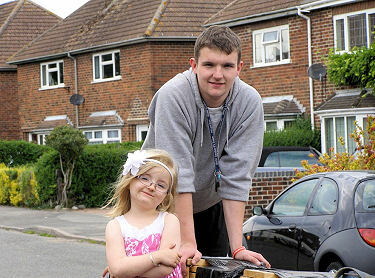 Jamie and Olivia Osborne. Image courtesy of Warren Osborne © 2011. After sorting everything out it was time to get some sleep before the overnight drive to Dover. After an uneventful drive down to Dover we arrived and were promptly pulled over for a security check. These always make me smile as they never seem to care or do more than want to look in your boot and ask if you have packed the bags yourself, but the lady did show some interest in the Cross. And after an explanation we were allowed on to check in. 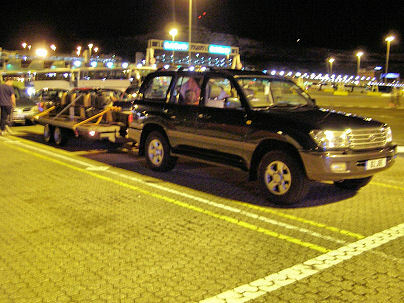 After check-in we were first in one of the rows which meant first on to the boat and therefore first off in France. As some of you must know this can be a real advantage to getting out of the docks on both sides off the water. On the Docks waiting to load on to The Spirit of Britain. Image courtesy of Warren Osborne © 2011. When we had loaded on the boat, two of the crew were looking at the packing crate and saw the signs that I had had made. They mentioned that they had seen the Crater on the BBC on Friday and complimented us on what a good job we were doing. Warren’s sign on the crate. Image courtesy of Warren Osborne © 2011. After another uneventful crossing on P&O’s new Spirit of Britain, which is an excellent boat, and of course all the hold ups at French Customs as normal! We were off on to the French motorway network for the 100 mile last leg of our journey. A small hiccup on this stage, but nothing a ‘bungy’ and a couple of cable ties didn’t put right. We arrived at the Crater around 8am CET (Central European Time). Cross safely at the Crater. And, giving some idea of the overall length of just under 12 meters. Image courtesy of Warren Osborne © 2011. With an hour to spare before we were due at Jean-Luc’s farm at Contalmaison, where it will be stored till later in June. We spent it looking around the Crater and looking at more of Vinny’s super work on the base for the Cross, with the sleeve fixed in and almost ready to go. More of Vinny’s excellent work. Image courtesy of Warren Osborne © 2011. When we got to Jean-Lucs farm, it was a chance for Emma to practice her French and time to pass on our precious cargo. As my French is limited to ‘Bonjour’, Emma performed a sterling service at this point. Jean Luc was soon sliding his barn doors open and firing up his fork lift, as Jamie and I started undoing the straps. Emma was on photo duty at this point, as Jamie and I were concentrating on getting the Cross off without damaging it on the last part of its journey in our care. At this point Vinny also turned up to make sure I had not cut the end off the Cross and that I had not harmed it in any way! Unloading at Jean-Lucs farm in Contalmaison. Image courtesy of Warren Osborne © 2011. I think Vinny and I both did a sigh of relief as it finally disappeared into the barn, both knowing it now only had a short 2.5km trip back to the Crater on the 29th June. As we were staying overnight with Martin & Kate Pegler at Orchard Farm over in Combles, we said our goodbyes to Jean-Luc and his wife and Son and took the trailer over to Orchard Farm for safe keeping rather than driving around with it all day. Martin supplied me with some spanners and a few tie wraps to finish off the little problem we had had with the Land Cruiser. After having refreshments and dropping off our bags we then set off to visit Lonsdale Cemetery to visit our family grave, and later over to Jon and Alison’s Old Blighty Café for dinner, which I must say Jon & Alison were so kind to us and would not allow me to pay and said that the meal was free, for bringing the Cross over. This was a most generous and thoughtful gesture on their behalf. At the end of the day it was back to Orchard Farm and the thoughts of Katie’s home cooking and soft beds for a well deserved sleep. The only part of the return journey to mention, it was the same P&O crew we had travelled out with, the same two deck hands that had spoken to us on the way out, said “see you got it delivered then”. And this sums up what the whole trip had been about. On the boat on the way Home. Image courtesy of Warren Osborne © 2011.